A unique solution for the everyday traveler. Visa's TravelMoney® card is a prepaid reloadable Visa debit card which offers travelers a safe and convenient alternative to travelers' checks or cash. Visa TravelMoney® is easy to use at over 25 million merchants worldwide. And you can obtain the local currency at over 1 million Visa ATM's around the world! You can load up to $5,000 on your personalized card and make purchases worldwide. Since TravelMoney® is a pre-paid card you can spend up to the value placed on the card anywhere Visa debit cards are accepted. The amount of that purchase is automatically deducted from the card. 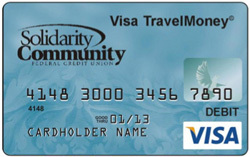 TravelMoney® cards are available at Solidarity.